Have You Planned Your Heart Attack? is not the next optimistic, self-help, heart disease reversal, low carb, cure-all approach to health. Believing that prevention is better than cure, it presents a proactive approach to cardiac disease prevention. It is the first-of-its-kind, offering a balanced and referenced discussion of coronary risk assessment using modern technology. Taking a picture of the coronary arteries using CT to see the health of the arteries is not new; it just isn't being done routinely. Yet, by using these advances you can be ahead of the game about your own cardiovascular health. Wouldn’t you want to know, rather than guess, if the single biggest killer in the Western world was lurking inside of you? We all know friends and family members who have suffered a heart attack, who live with angina or endure shortness of breath. A disease has developed. 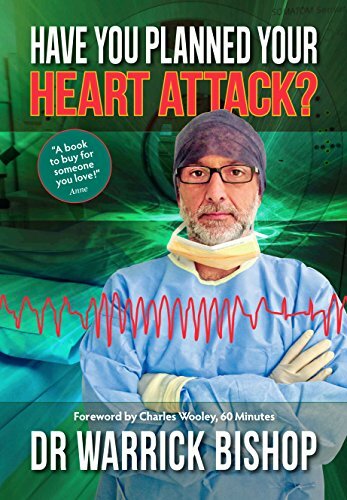 This book explores how we might be able to prevent the disease, especially a heart attack, from occurring in the first place. Treatment for risk, prior to an event, is primary prevention – the focus of Have You Planned Your Heart Attack?. Until recent times, primary prevention largely involved treatment of the unknown. Historically, risk assessment has been based on a number of factors observed in a population (or number of people). This observational data includes increasing age, being male, increased blood pressure and smoking. Now, today’s technology also allows us to look at the health of an individual’s coronary arteries in exquisite detail. The use of CT imaging, before the onset of a problem, is a paradigm shift in the conventional management of heart disease. Although formalised guidelines or recommendations do not exist for some of the issues covered in the book, a logical and systematic approach based on the science that is available today allows us to looking more broadly at our understanding, and application, of preventative cardiology. Image information, combined with the information gained from the historically-used traditional risk factors, allow specialists, general practitioners and patients to be ahead of the development of coronary artery disease so that measures to reduce risk can be implemented. Although cardiac CT imaging has been readily available for the past five to 10 years, it has not been broadly taken up. The hope from this book is to begin a conversation which ultimately increases utilisation of cardiac CT imaging, in combination with other risk factor evaluation, to improve primary prevention for coronary artery disease. Its vision is that imaging will be incorporated into a more holistic approach, thus improving the way we deal with the potential risk many individuals carry in regard to coronary artery disease. As this technology becomes more familiar to the community, then its use could be at the coalface for general practitioners who are, by virtue of their position in providing medical care, the custodians of preventative medicine. As we are comfortable with mammography, pap smears, measuring cholesterol levels and blood sugar levels, could we see cardiac CT imaging as one of the tools available for widespread implementation in public policy? For change to occur, we need conversation followed by action. The information offered throughout this book is accompanied by an invitation to be part of that conversation. Criticism and controversy are healthy parts of vigorous conversation, as too, are vision, passion and an enthusiasm for possibility. If this book starts such conversation that opens doors to further evaluation, and discussion – and along the way improves medicine and saves lives – then that is a good start.